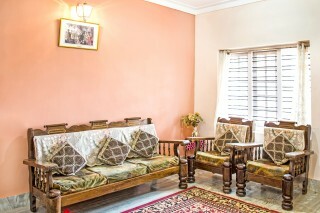 Located in the heart of the city, this is an offering of a two-bedroom homestay, and is ideal for a group holiday. 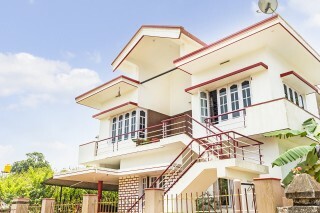 The property is just 1 km away from Madikeri Fort, and the room on offer can accommodate up to eight people. 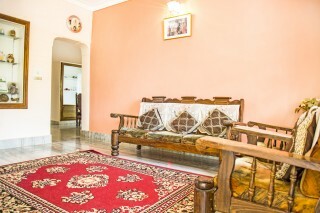 Your Space This homestay is furnished to ensure you have a comfortable stay. The living room houses a plush sofa set and a coffee table for convenience. 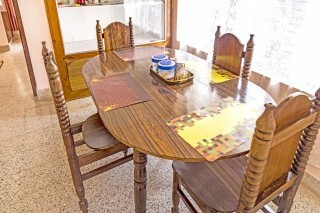 A four-seat dinette is placed for you to dine with your travel companions. The kitchen is equipped with a refrigerator, a microwave, and a gas knob so you can relish a tasty home-cooked meal. The bedrooms are functional and furnished with a double bed and a side table. The master bedroom has two double beds. The en suite washrooms are tiled and well-appointed with western sanitary ware and modern fixtures. Guests are requested to provide valid ID proof at the time of check-in. 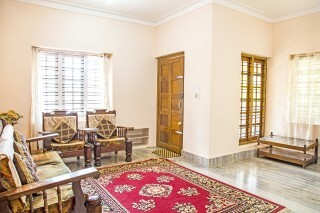 An additional bedroom, third one on the first floor will also be provided in case the number of guests is more. 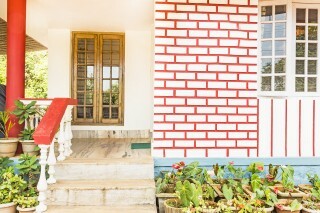 A maximum of 10 persons can easily be accommodated in the homestay.• Extra beds will be provided on request. Breakfast is complimentary. Taxi, pickup will be arranged on specific request. 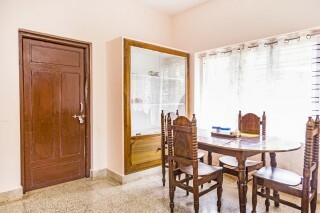 The kitchen is provided with a fridge, microwave oven, water purifier and a coffee maker. Carrom board, chess board, playing cards are available. Books for children's and toys for kids are also made available. A very beautiful scenery is also visible from the open terrace of the homestay, especially sun rise and sun set. ""Beautiful scenery visible from the open terrace of the homestay, especially sun rise and sun set""
It was an amazing homestay! To start up with Friendly host,good house, amazing breakfast to add upon best thing was the dog which is the gate keeper for the house! :P We named him as "checkout". For instance even when we reached the homestay in the mid night he made sure that there was a smooth check-in process. Secondly, the morning breakfast with a coorg special coffee gave a us an amazing feel. Not too much of restrictions. #saisadan #fun #groupplace #vfm #willsuggesttoanyone #willcomebackforthestayagain. Thank you guesthouser! My experience was nice as the property was in a good locality with all the important facilities, not just that it was clean and spacious , host and staff was also very cooperative , guesthouser application helps . My stay over the property was perfect. 5/5 ratings from me. The property is very nice. Great services by Host and Guesthouser.